Other brands make electric plans. Could the Chevy Bolt be big in Mexico? The automaker is definitely making a marketing effort south of the U.S. border in the face of renewed interest in more efficient vehicles. That interest jumped dramatically starting in December after the country’s newly-elected president, Andrés Manuel López Obrador, decided to close state-owned pipelines in favor of distribution by trucks. That not-well-executed move caused bottlenecks, resulting in fuel shortages. According to Automotive News, the scarcity of gasoline in some regions has sparked a couple hashtags: #ReporteGas (gas report) and #DondeHayGas (Where is there gas?). Chevrolet smartly jumped on the opportunity by launching a media campaign for its all-electric hatchback. It leverages the hashtags, see the image from a tweet above for an example, and promotes its Chevy Bolt, the third plug-in vehicle the automaker has offered in the country. It sells the Volt there, and previously sold the Spark EV as well. 18 Comments on "Chevy Pitches Bolt In Mexico As Gas Shortage Hits"
Most people charge in their home and with 240 miles of range there may be little need to rely on public chargers. Smart move on GM’s part and several other manufacturers. Where there are EVs, EV chargers will follow. As with EV drivers here, the majority of charging will occur at people’s homes. It’s good to see that at least GM is aware of that marketing opportunity. The interesting thing is that now, in contrast to prior oil crises, all the pieces are in place as far as EV’s at dealers, ready for purchase, that people really will have an alternative when the next ’emergency’ hits. Due to people siphoning gas from pipelines, which then explode, killing people. but at least people aren’t dying. Leave it to GM to try to make some positive press out of a really dire situation. So, now that GM is marketing the Bolt, you still whine like a pig (year of the pig)? I guess haters will always turn even a shred of positive news for EV instead something negative. 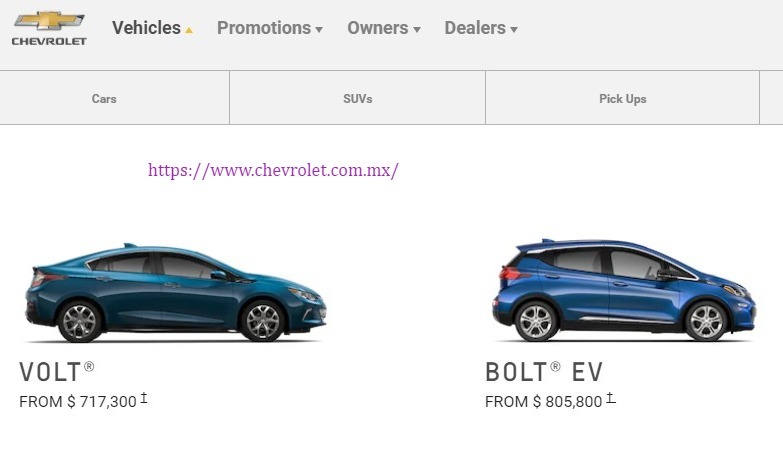 Any idea how the Bolt EV is priced, if there are incentives, and how many people could actually afford it in Mexico? Just go to the website. The link to the twitter account above which also gives the website. What about incentives from “de los estados y los gobiernos federales”? Even funnier is that Ford builds the Fusion Energi PHEV in Hermosillo, Mexico. But they don’t offer it for sale in Mexico. Missed opportunity. Detroit in a nutshell, they almost never miss an opportunity to miss an opportunity! Fiat 500e is built in Mexico, too. I say it’s alot easier to steal electricity than gas….win win! The obligatory monthly protection fee for the local gang is included. Another case of green tech filling in for fossil failures. Is Tesla selling in Mexico?